Wao! you know well. n? Did you read my blog? a~ah! I see. That's our conversation after finishing lunch. It was my pleasure to know someone reads my blog. We met at the JR shinkansen entrance. They came to Kyoto and went back to Tokyo by Shinkansen. They didn't stay in Kyoto. So I took them what they really wanted to see. By e-mail, they requested me to take them to Fushimi Inari, Golden Pavillion, Kiyomizu temple, Nishiki Food market, Ginkakuji( Silver Pavillion) and Phylosophy path. Covering all the places in a few hours looks tough and is almost impossible. So we decided to skip Silver Pavillion and the phylosophy path. 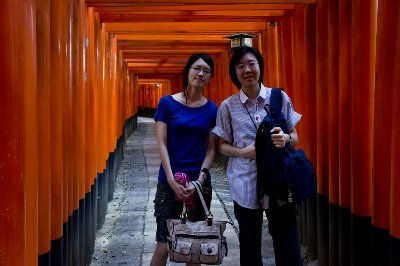 Fushimi Inari has been getting more and more popular among foreign tourists thanks to easy access to infomation through the internet. In addition, the famous torii tunnel appeared in the movie of Memoir of Geisha, in which the young heroin runs through the torii tunnel. Do you remember the scene? They have seen this movie. After we met at the JR station, we headed for Fushimi Inari using a JR line to witness this beautiful scene on the spot! Along with my blog(? ), after visiting Golden Pavillion, we had OKONOMIYAKI lunch. They came from Malaysia so we talked about noodles. They told me what they eat in their country. It was very interesting to me! We enjoyed Nishiki Food Market. and Kiyomizu temple. 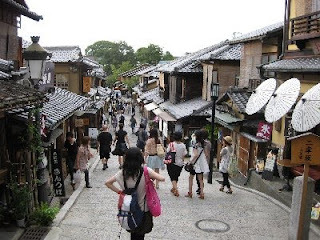 We walked along the famous street from Kiyomizu temple to Yasaka shrine. And I took them to Gion. I had to say good bye here! Gion is the very place the movie dipicted about. They seem to have enjoyed Gion and went back to Tokyo by Shinkansen on that day. However, Kyoto has a lot of places to see and experience. I think a few hours are not enough. 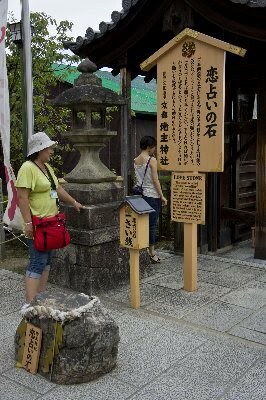 When they come back to Kyoto again, I will be happy to be their guide and show them around to the nice places!! an Interest in Black Sesami softcream icecream!